Wish Upon a Coin--a hilarious new Mickey Mouse short was published to YouTube about a week ago. 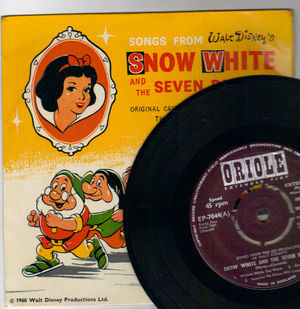 It features not only Mickey and Minnie but a several other Disney characters including Snow White and the Seven Dwarfs. 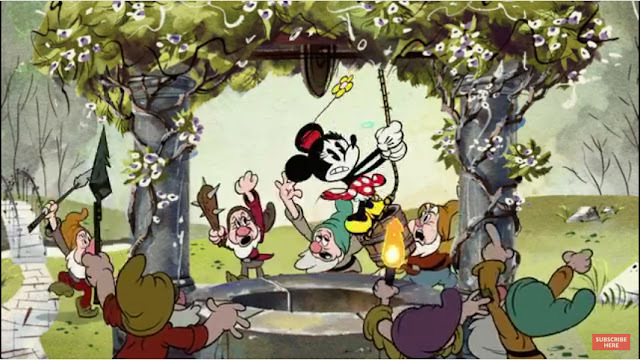 Video posted by Disney Shorts. 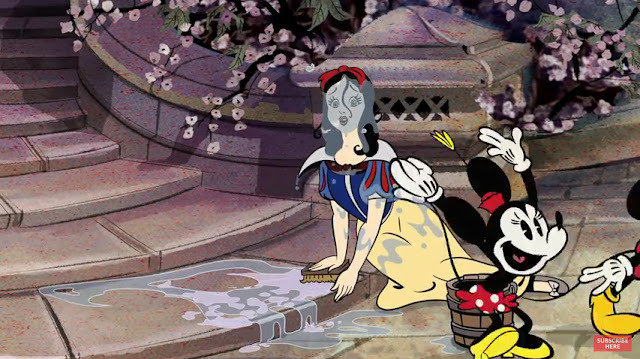 The story begins innocently enough, with Snow White washing the steps to the Queen's castle. 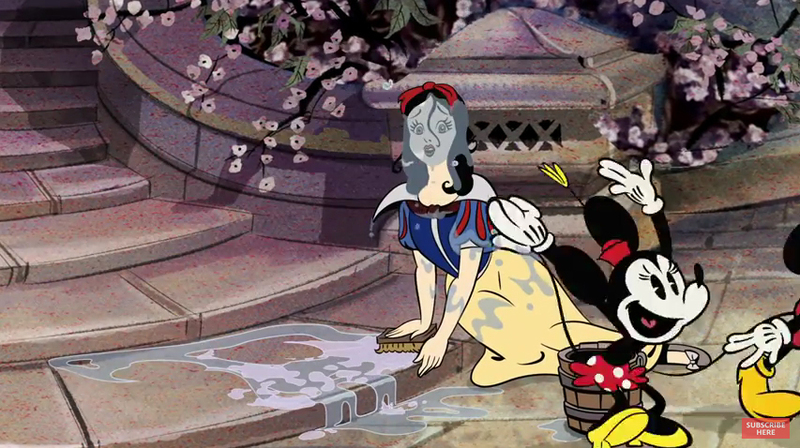 Moments later, however, the comedic tone of the film is set when Mickey and Minnie splash by on their way to the Wishing Well, leaving the princess drenched. 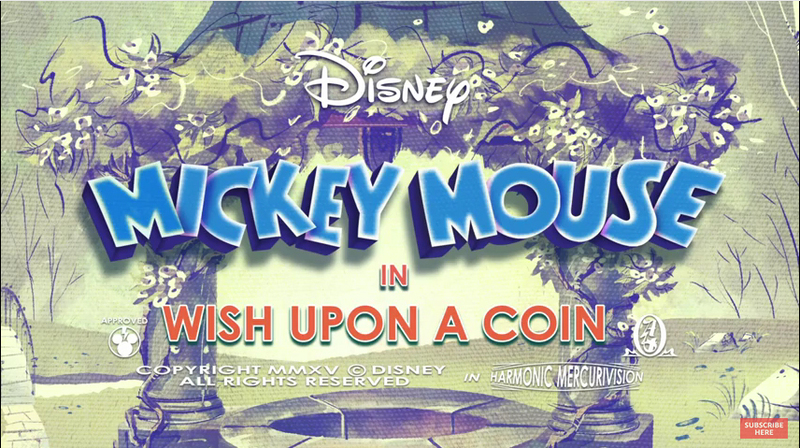 Mickey and Minnie sing I'm Wishing, then the classic villain Peg-Leg Pete steals all the coins. Now nobody's wishes will come true. Mickey takes off in pursuit and all pandemonium breaks out. 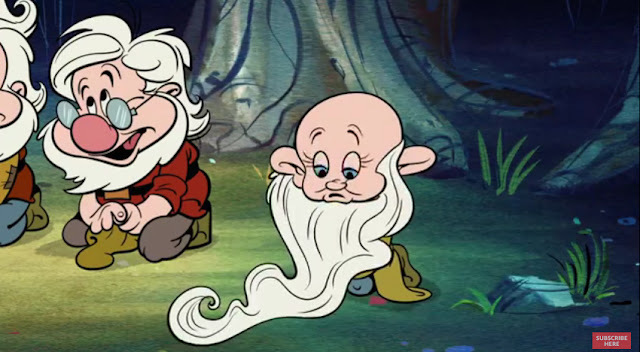 In the end, Mickey saves the day and everyone gets their wishes fulfilled--which for the dwarfs apparently means full heads of hair, plus a beard for Dopey. 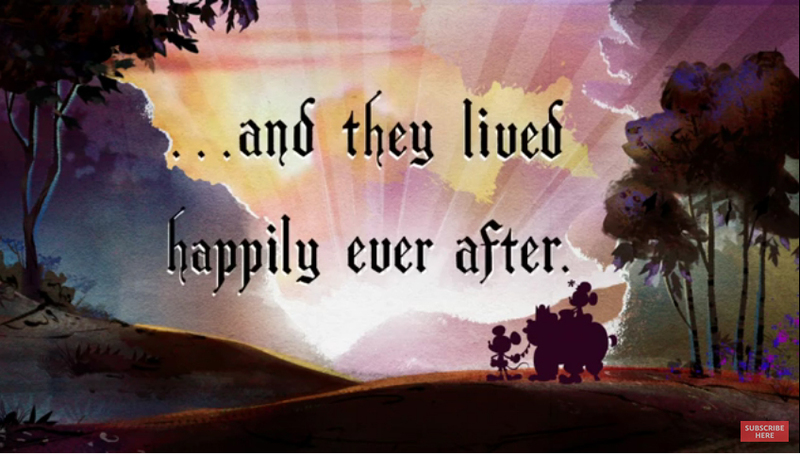 And to take a page out of Snow White, "they lived happily ever after." Special thanks to Dan Alexander Dizmentia and Joey Gallagher for posting the short on our facebook page. 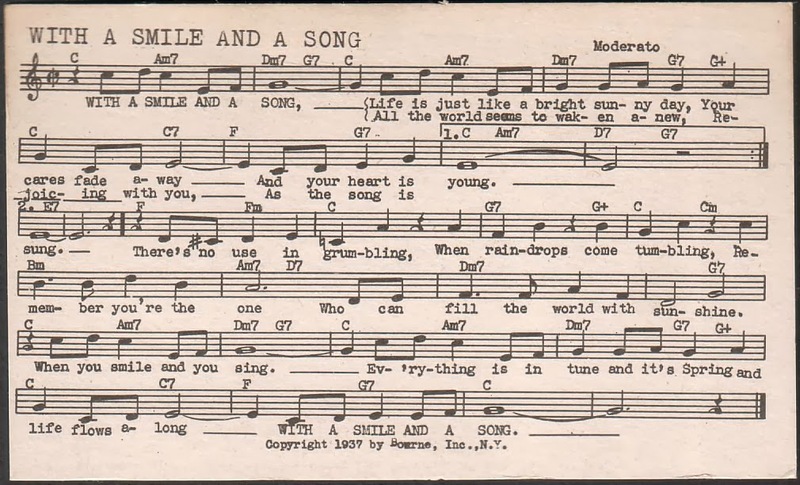 George Goodwin, a radio station program director, first published the cards in 1942 and continued publication until 1963. The creation of the cards grew out of Goodwin’s need to have a reference source when selecting music for radio programs. 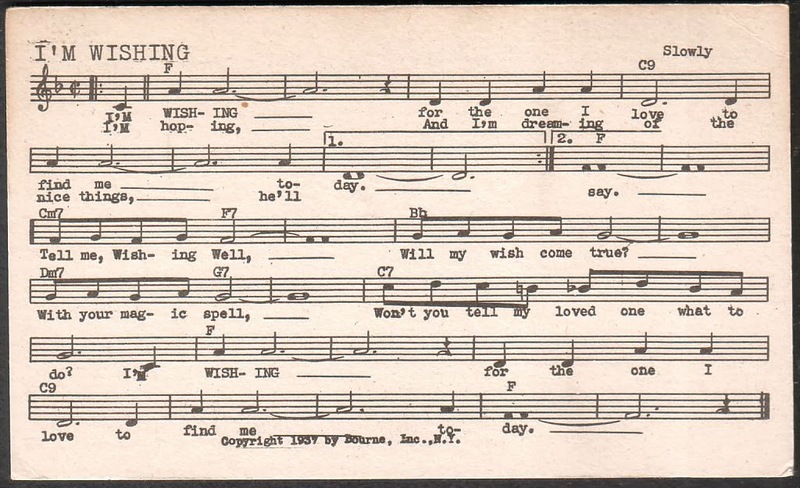 The cards were also marketed to musicians as a tool to aid in remembering songs for performance. As a result, the cards later morphed into the widely used “fake books” of today, which are basically bound volumes of lead sheets. Recently, three Snow White Tune-Dex cards from 1945 popped up on ebay. Not only do they include all the basic information for each song but also the performance fees for that year. 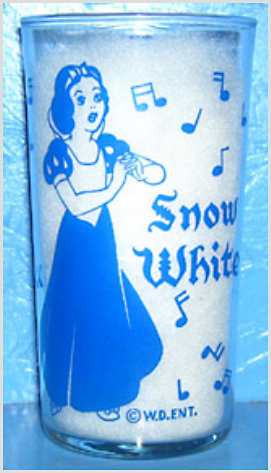 With the success of the 1938 Snow White "four-line verse" dairy glass premium give-away (see earlier post), a second series of glasses was produced. 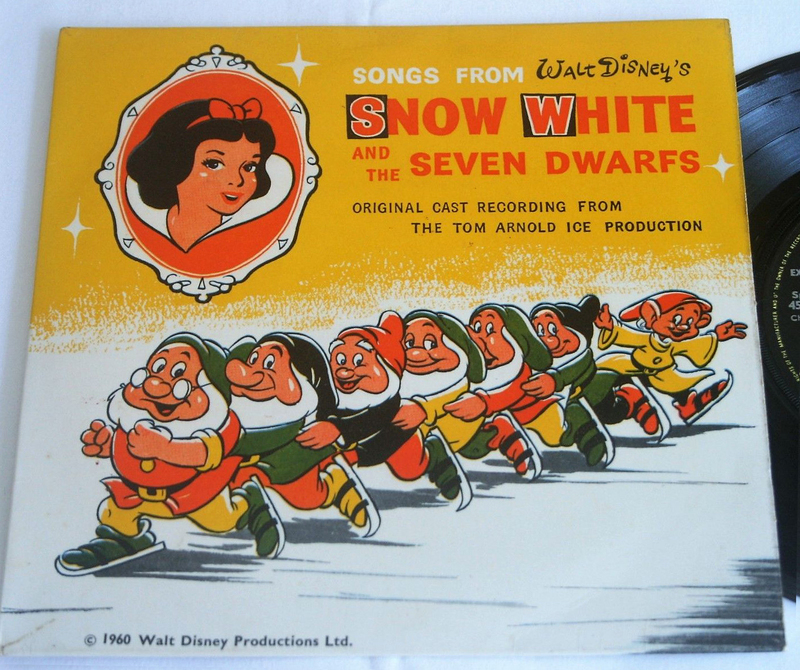 This scarcer "musical notes" set includes a singing Snow White, six dwarfs playing instruments, and Grumpy conducting. Musical notes float in the air around each of them. 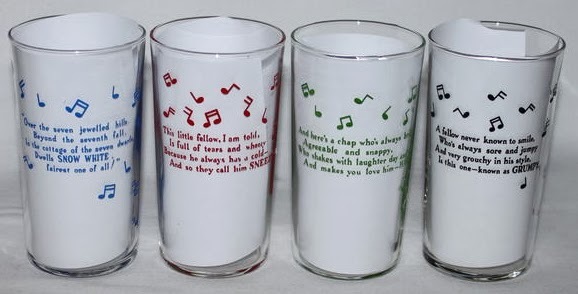 Eight tumblers in all. Two sizes, 4.75" and 4.625". 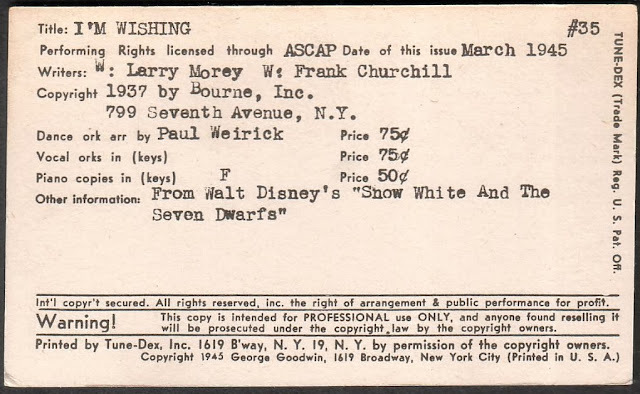 Copyright "W.D. Ent." Issued in the US. 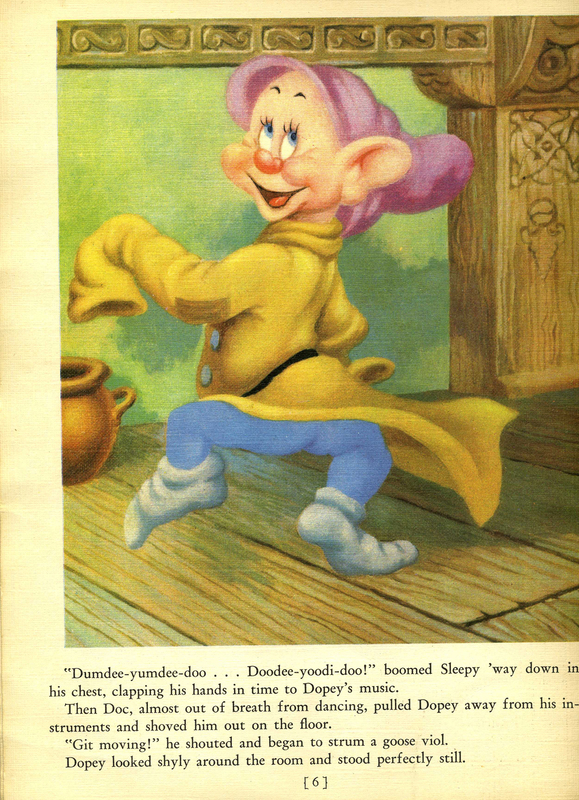 On the opposite side is the same four-line verse seen in the first series. 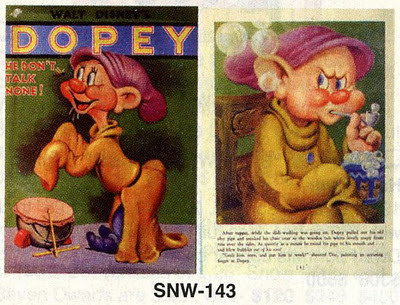 Images courtesy of Disneyana Vintage Collectibles 4U + Hakes. 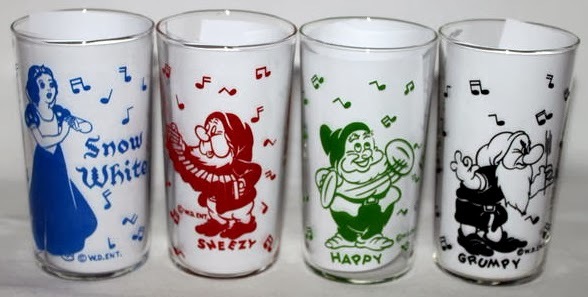 See a 1938 Kroger newspaper ad for these tumblers in another post. 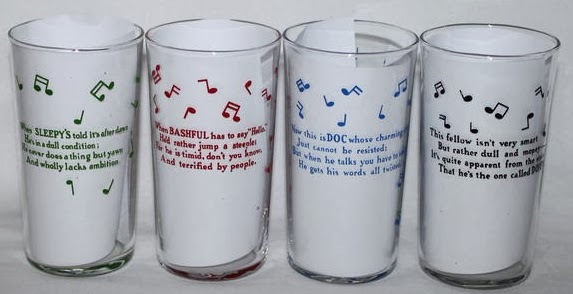 A similar "musical notes" series of glasses was released by dairy producers in Canada. See it in an upcoming Archive entry. 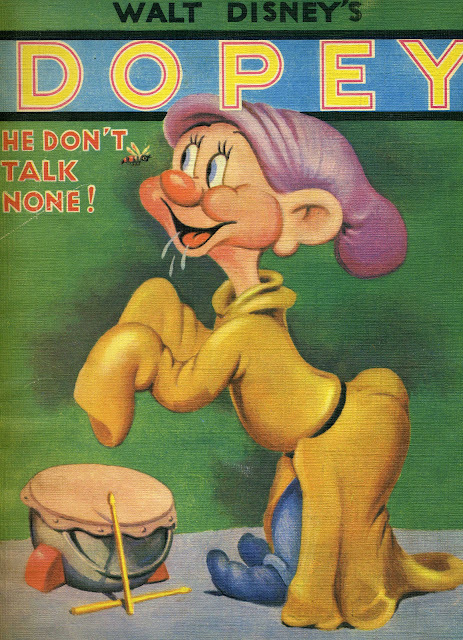 Dopey He Don't Talk None (no. 955), printed on linen-like paper by Whitman Publishing Company, 1938. Contains 12 pages of full-color illustrations (including covers). Measures 9" x 12". 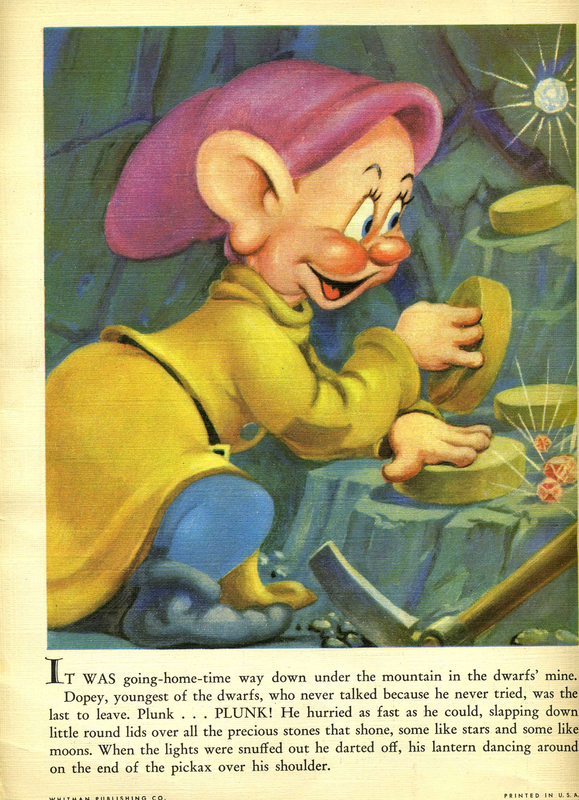 In the first part of the book, Dopey heads home from the mine with the rest of the dwarfs. 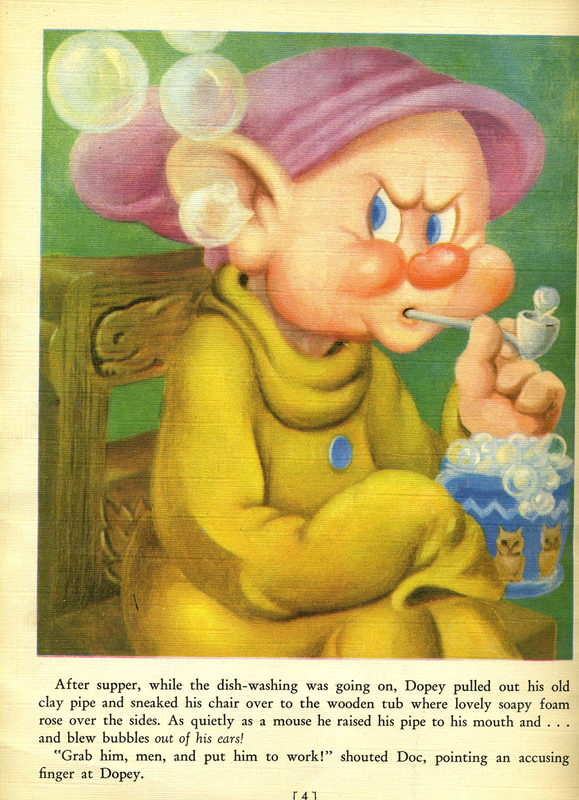 After dinner, he blows soap bubbles out of his ears and makes music with his drumsticks. 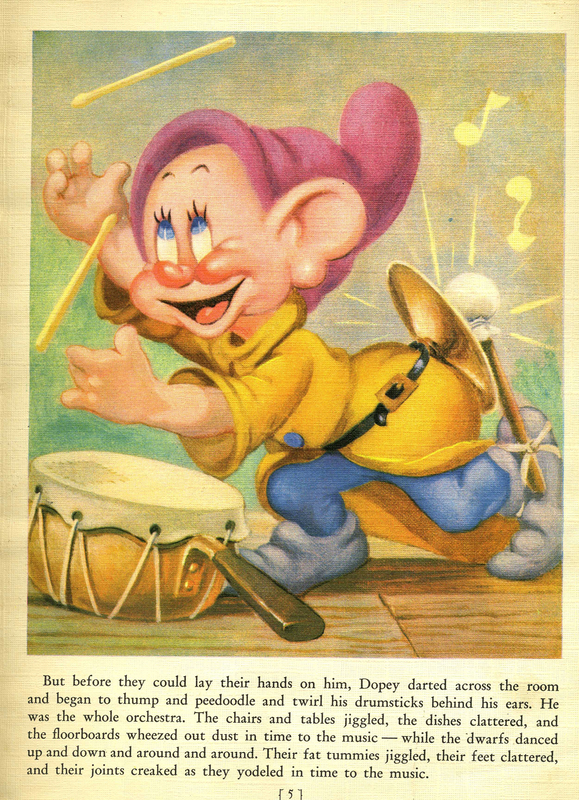 He then takes center stage dancing while the others play the instruments. 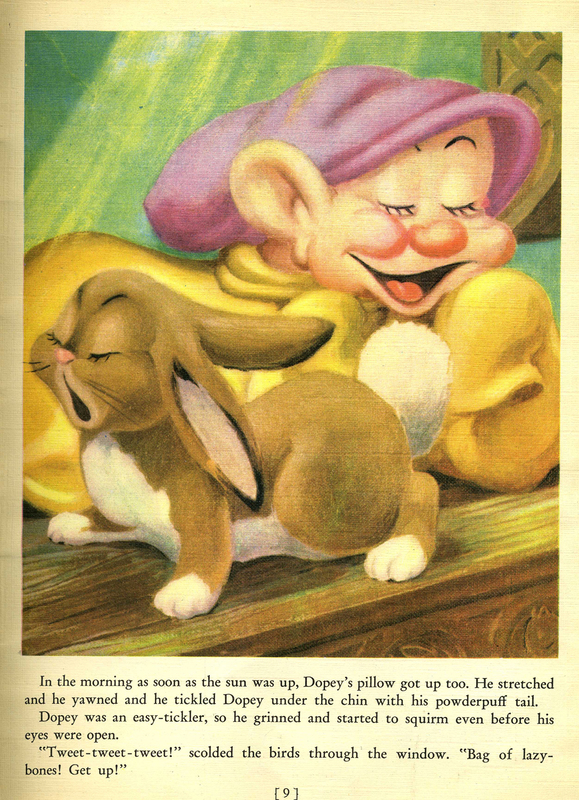 That evening, he falls asleep on a bench, curled up with a bunny. In the morning, he jumps up to start cleaning with a feather duster but ends up chasing a loose feather all over the room. The dust causes Sneezy to explode with a big sneeze--so big that it blows Dopey up the chimney and onto a tree branch. 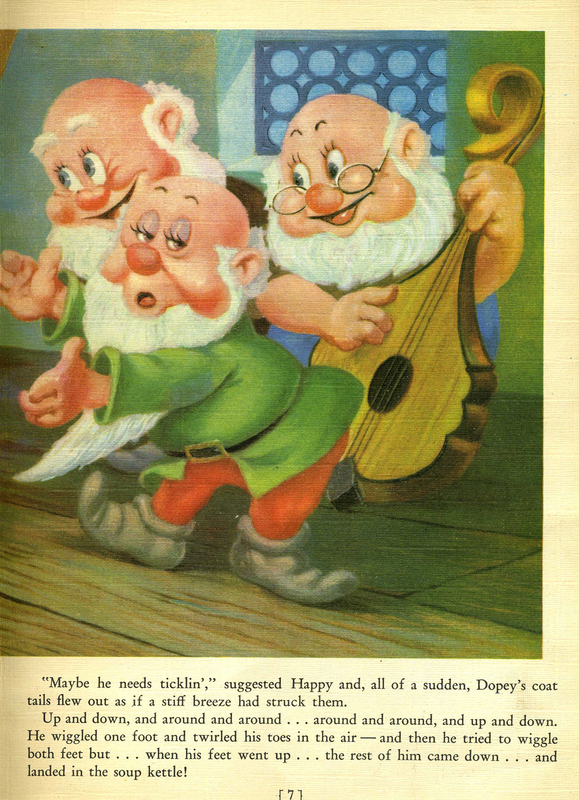 The book is listed on page 839 in Hake's Official Price Guide to Disney Collectibles (2nd ed.) . 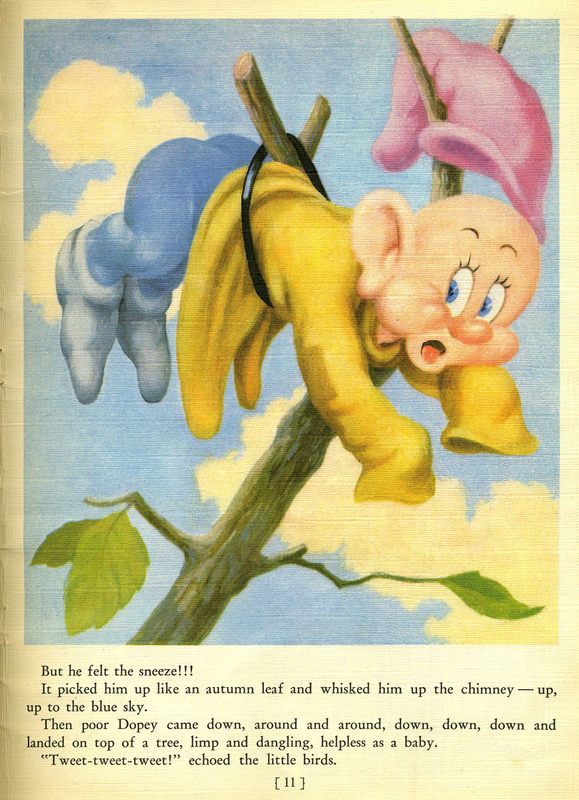 Special thanks to 1937Fan of Whistle While We Blog for sharing the image scans. 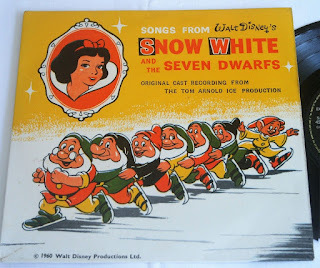 A program from Tom Arnold's adaptation on ice of Snow White and the Seven Dwarfs. Issued for the performance at the Palladium in Brighton. 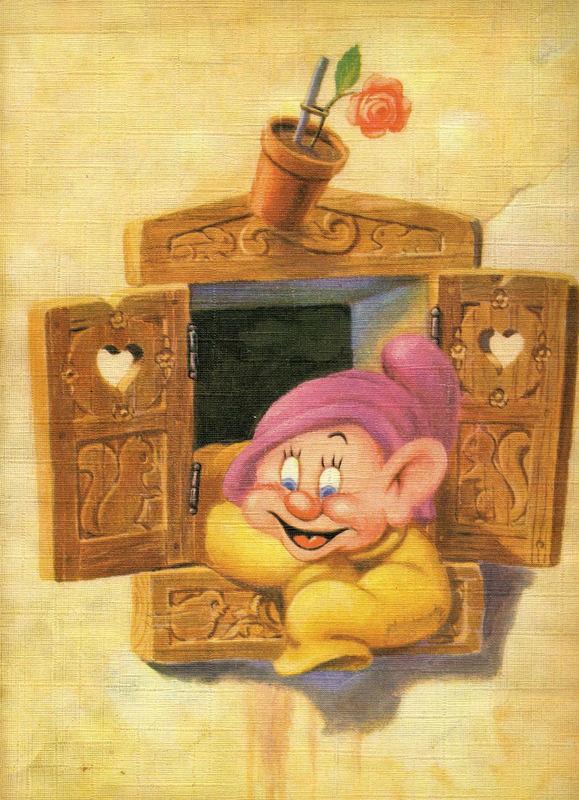 Twelve pages (including covers). Produced and directed by Gerald Palmer. 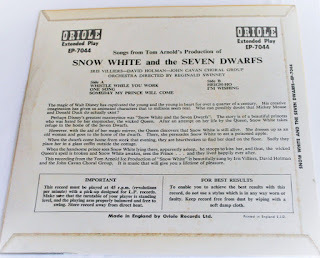 Jacqueline du Bief as the Evil Queen, Sue Park played Snow White and Douglas Breniser was the Prince. 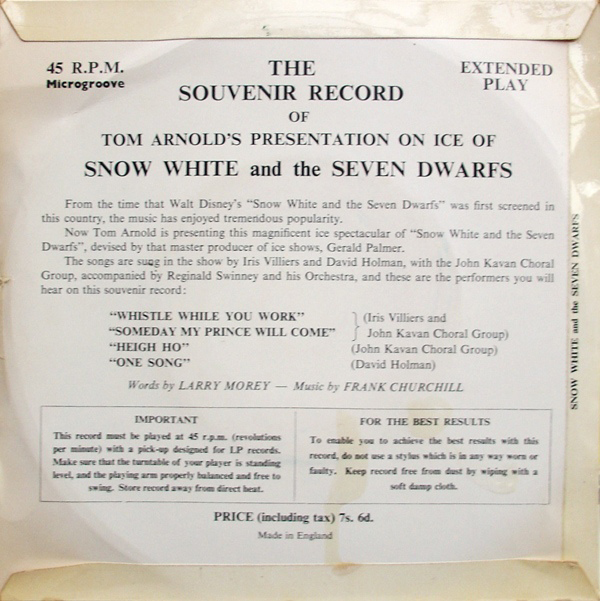 Learn more about Tom Arnold's Snow White production in an earlier Archive entry. 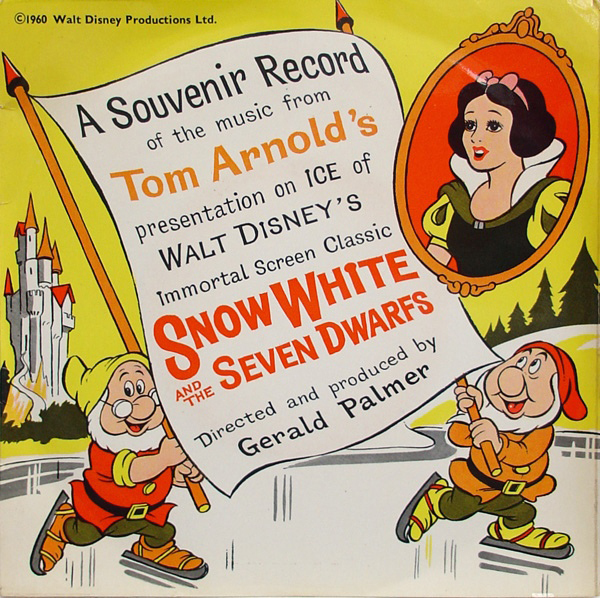 Tom Arnold's Snow White ice production of the 1960s was quite popular in the United Kingdom. 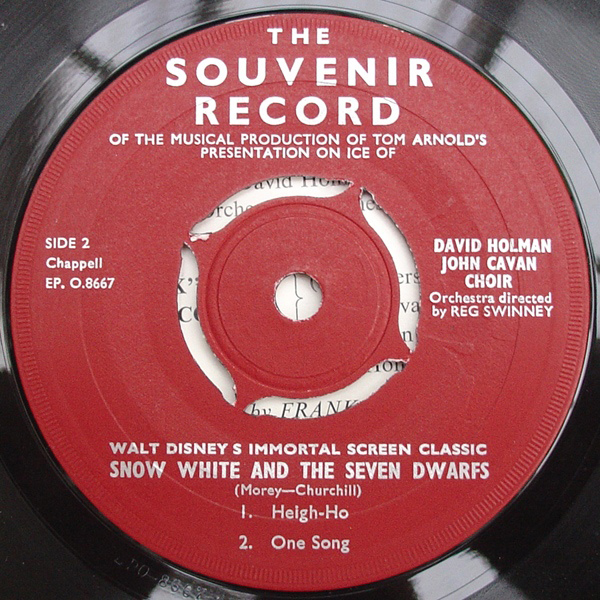 Audience members could purchase a "Souvenir Record" featuring four songs from the performance. Artists: Iris Villiers, John Kavan Choral Group, and David Holman. Orchestra directed by Reginald Swinney. Format: 45 rpm, 7" vinyl. Label: Chappell. Disc no. EP. O.8666/8667. 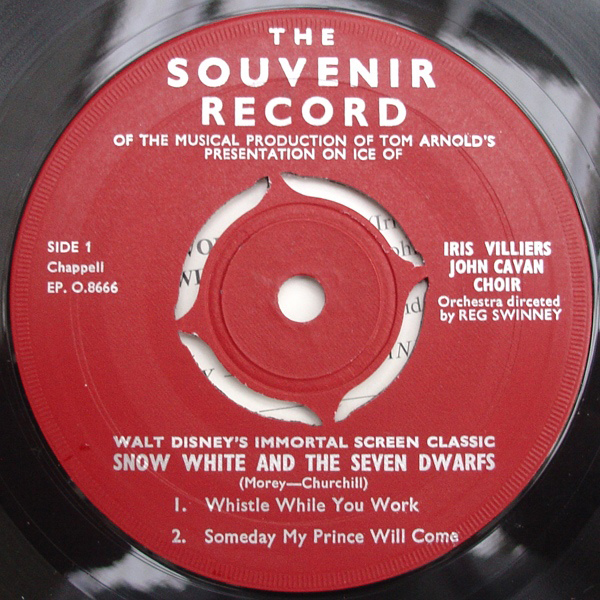 "© 1960 Walt Disney Productions Ltd." Original retail price 7s. 6d. 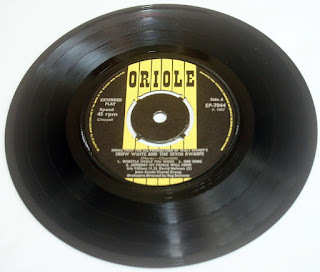 Another 45 rpm record was released on the Oriole label. Catalog no. EP 7044. 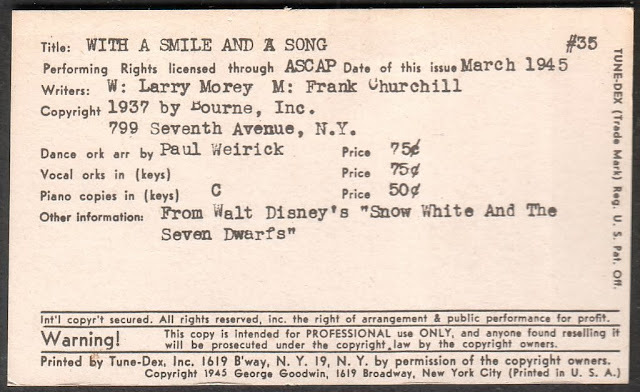 It contained five songs--the same four from above plus I'm Wishing. 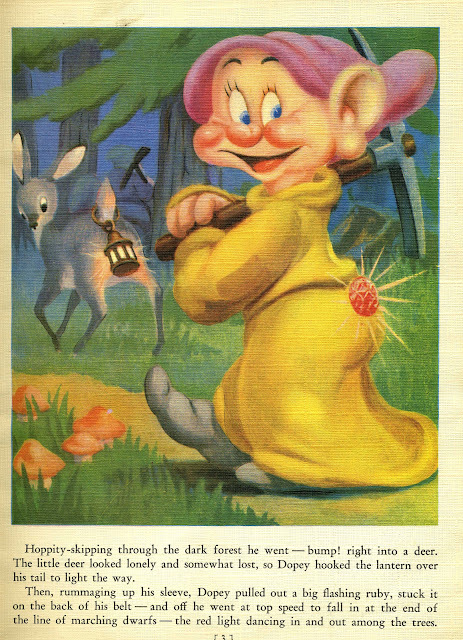 Cover illustrations by the Disney Studios. One printing had maroon colored labels, another brown & yellow. 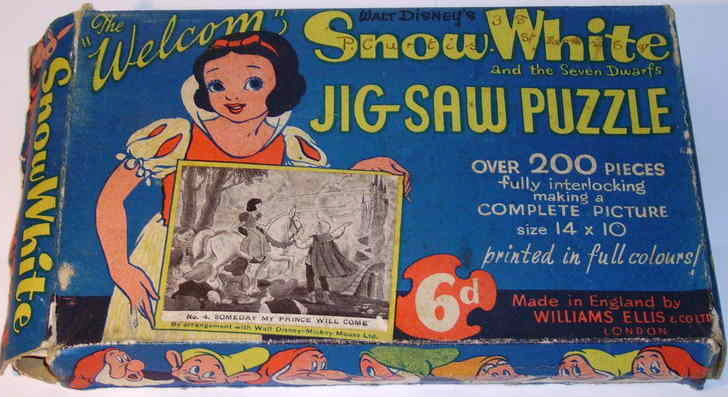 In the United Kingdom, circa 1938-39, puzzle manufacturer Willliams Ellis Co., Ltd. issued a series of eight numbered Snow White jigsaws, each containing over 200 die-cut pieces. Puzzle dimensions: 14" x 10". 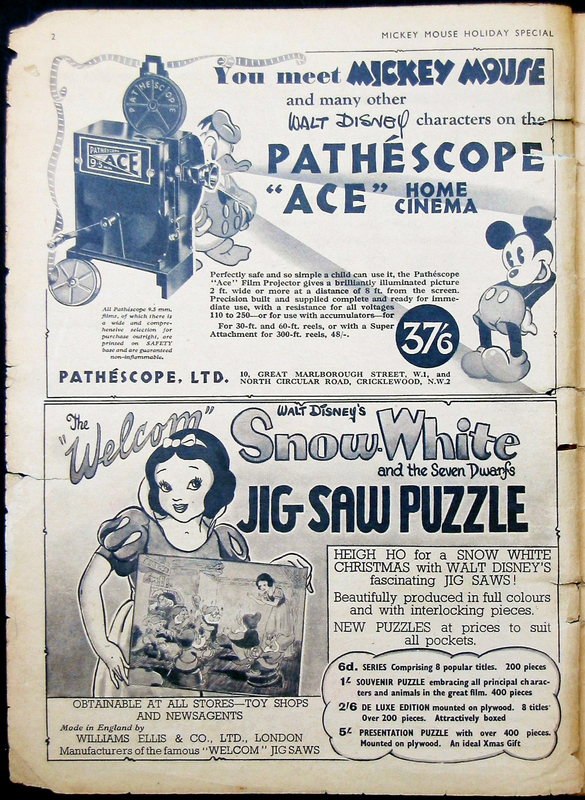 Retail price per box: sixpence. The package designs are identical with an illustration and text on both sides, except that on the front, Snow White holds a B+W photo of the individual puzzle. 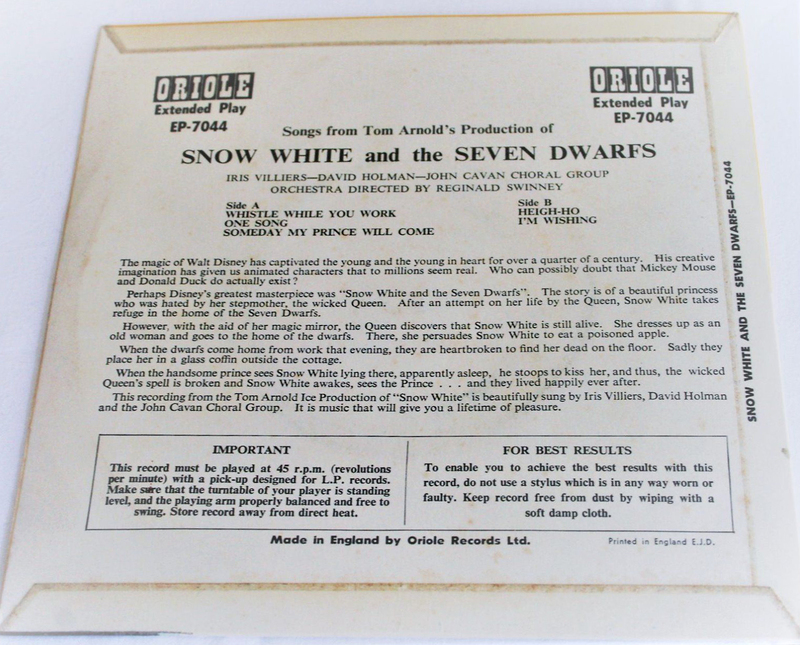 On the back, is a list of the eight in the series. Box measures approximately 8" x 5". Lining the top and bottom edges are the dwarf heads. No. 1 in the series is an image of the dwarfs marching in a row, and it's labeled Heigh Ho. No. 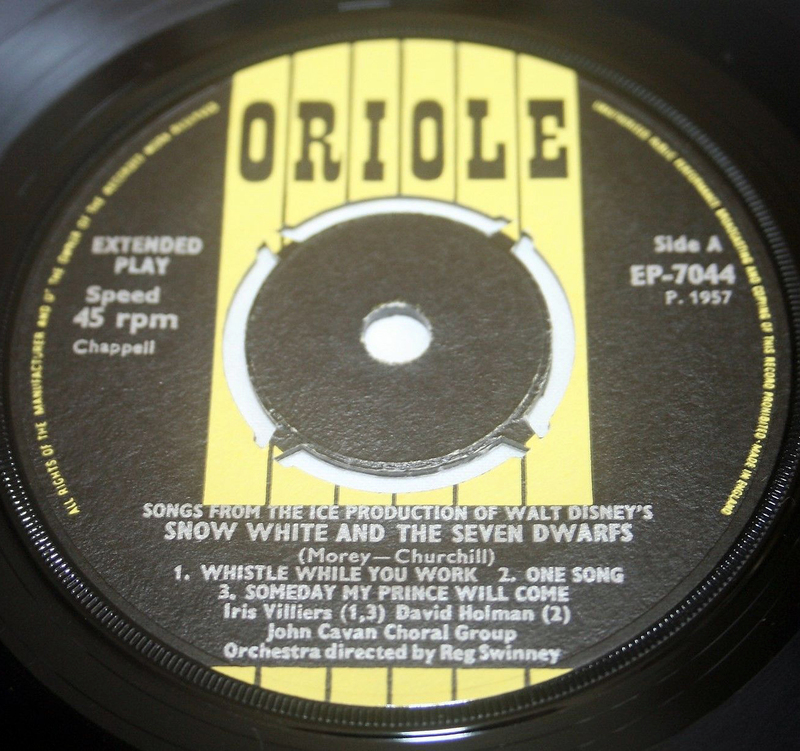 2, Whistle While You Work. No. 4, Someday My Prince Will Come. No. 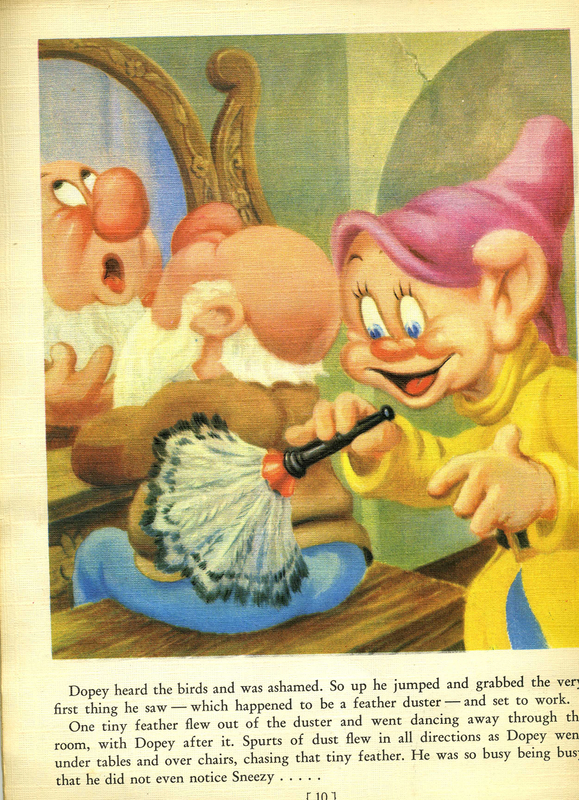 5, Introduction of the Dwarfs. No. 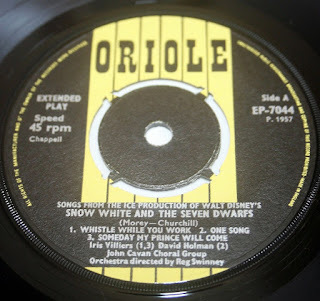 6, The Wishing Well. No. 8, Outside Dwarfs Cottage. An ad for puzzles appeared in the 1938-39 Mickey Mouse "Holiday Special" Magazine. 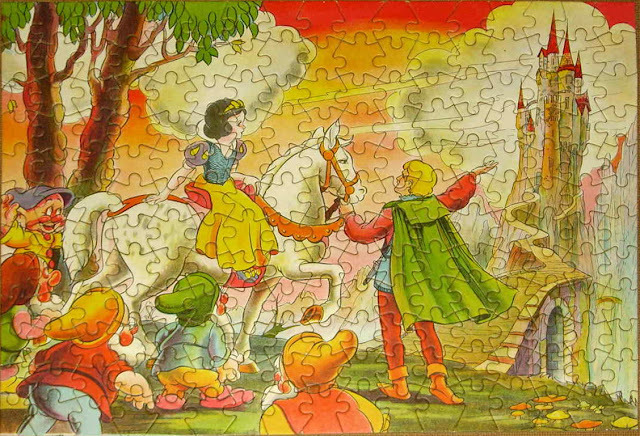 If you missed it, see the 400+ piece jigsaw by Williams Ellis in an earlier post. Also see another 200+ piece series in a later post.